Let the doors of this church be a way to service. Saturday worship at Westminster resumes on April 27 with a 5:00 p.m. service in Parish Hall. Join our Saturday night worshipers for the season’s traditional opening reception in Parish Hall on April 27. Light appetizers and punch will follow worship. The Rev. Christian Choi will preach on April 27. We are grateful for the innovative music provided by Deb Watts and the Westminster Jazz Trio. Members are encouraged to join us for this meaningful worship experience! The Rev. Dr. Blythe D. Kieffer will give the sermon titled "Garden Serendipity" based on readings from Isaiah 65:17-23 and John 20:1-8. The Ministry of Music including Handel's Hallelujah Chorus and other festive music will be presented by the Westminster Choir, Millikin Brass and Dale Rogers, Organist. Information about who we are is in our Welcome Brochure located in the pew pockets and on our website at www.wpcspi.org. Please complete the Ministry of Friendship folder located on the end of each pew. Sign up begins Palm Sunday in the West Narthex. Plan to join with your Westminster sisters to paint and/or prepare lunch. 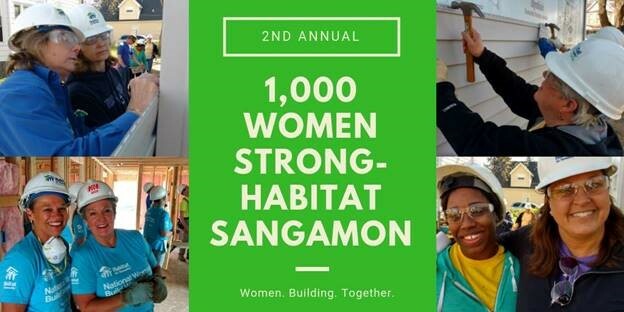 Women of Westminster are invited to join in the Second Annual 1000 Women Habitat Build by donating $100 here. As of March 31 donations totaled $88,000. The goal is $100,000. If you are interested, contact Sue Sawers at sssawers@comcast.net. More details will be forthcoming!! to own our Presbyterian heritage, reformed and always reforming, to be prayerfully open to the renewing power of the Holy Spirit. Westminster Presbyterian Church is an Earth Care Congregation of the PC (U.S.A.), committed to caring for God's earth in worship, education, facilities, and outreach, promoting environmental stewardship in property decisions, administrative practices, and teaching. Click here to read the latest Earth Care tip. ​1 PM to 5 PM at the Old State Capitol.